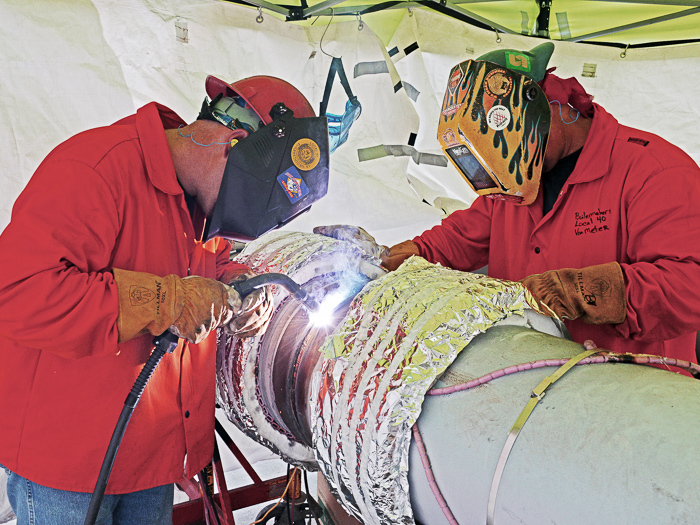 Local 40’s Stephen Small welds a seam on the “skin” of a HRSG. 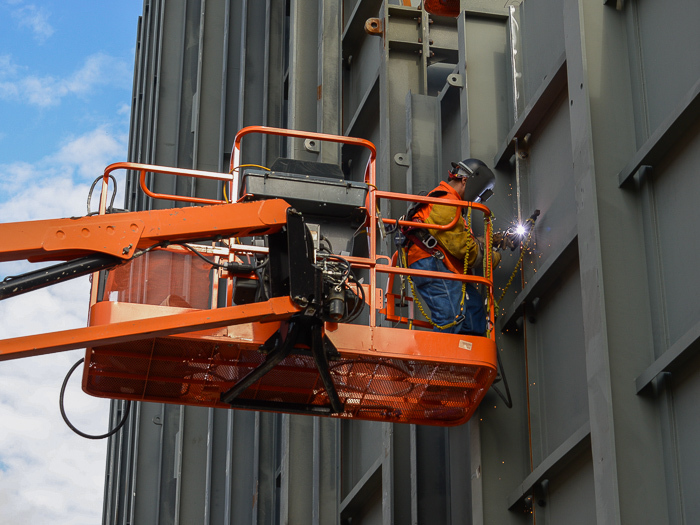 Boilermakers work from man-lifts to attach a steel shell to a HRSG unit. Oblong tanks at top are steam drums. Kiewit keeps track of progress with the aid of daily drone overflights. Louvered-shaped turbine filter houses bring in outside air for combustion with natural gas. Adam Williams, Local 40, rolls up a tag line after a wall section lift. Local 40 members Jarrod Smith, left, and William Van Meter weld steam header sections. 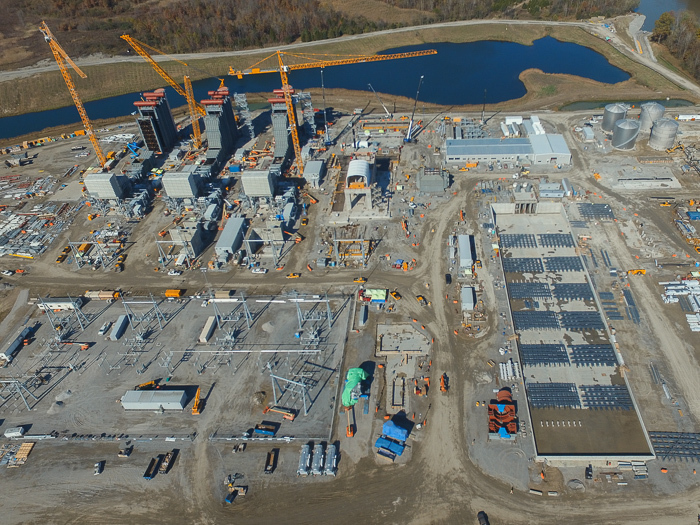 CONSTRUCTION IS ADVANCING steadily on a $1 billion combined cycle gas turbine plant adjacent to the Tennessee Valley Authority’s Paradise Fossil Plant in Drakesboro, Ky. The gas plant will replace two coal-fired units com- pleted in 1963 at the Paradise facility. A third coal-fired unit at the site, completed in 1970, will remain operational. 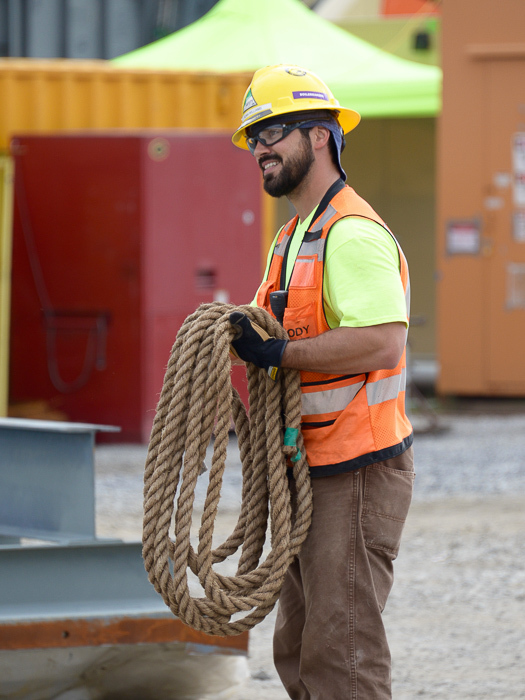 Some 80 Boilermakers, primarily from Local 40 (Elizabethtown, Ky.), are involved in the combined cycle project, along with other union trades. 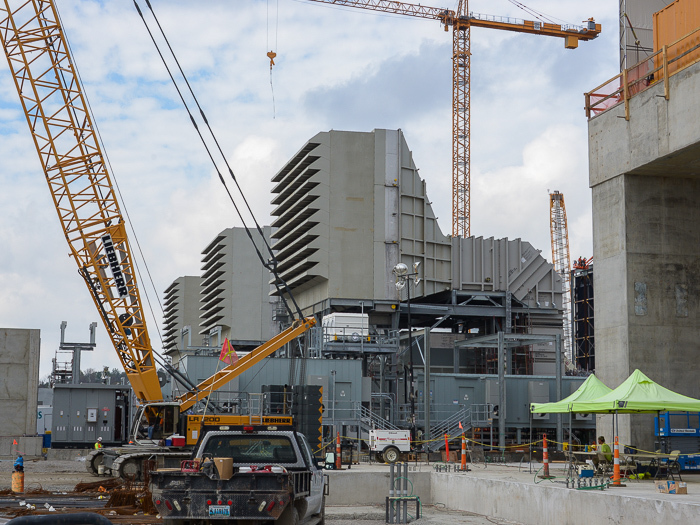 Kiewit Power is the prime contractor on the three-unit, 1,100-megawatt plant. In the project’s combined cycle configuration, natural gas and compressed air combust to turn blades on a turbine, which, coupled to a genera- tor, produces electricity. Exhaust heat is channeled into a heat recovery steam generator, or HRSG, which rotates to produce additional electricity. Spent steam is then piped into a condenser, which cools the steam and converts it to water for reuse in the HRSG. The project began in March 2015. 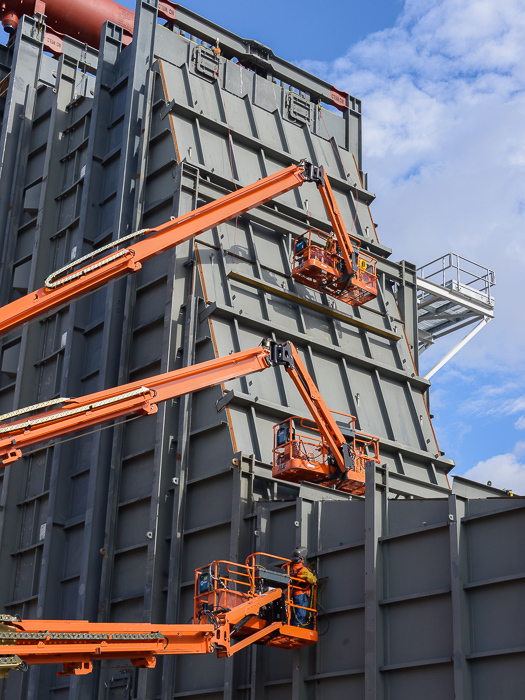 Despite a two- month permitting delay, the job is proceeding on schedule, says Erich Budde, Kiewit HRSG Depart- ment Manager. The Boilermakers scope of work includes the combustion turbine filter houses and intake ducts, combustion turbine exhaust ducts, bypass stacks, exhaust stacks, HRSGs, demineralizing and ser- vice water tanks, and a 1-million-pound steam surface condenser. Kiewit estimates that 180,000 Boilermaker man- hours will be required on the project. Crews are working nine-hour shifts, six days a week, with safety the highest priority. After 70,000 man- hours, Boilermakers have not sustained a single recordable injury. Project completion is set for spring of 2017.